Shotwell on #SpaceX Falcon 9 manifest: Turkmenistan 3/21, pad abort slip to April, NASA cargo mid-April, then another CRS + Jason-3 in July. Hmm, not sure what happened to any launches in May / June, or she just didn't mention them due to some uncertainty / client constraint? Sounds like SES-9 and Orbcomm payloads may not be ready before the Jason-3 launch. This missing payload seems to be SES-9. CRS-7 was scheduled for June 22, seems it's slipping to early July (perhaps at NASA's request). Jason-3 was waiting on NASA certification, which is not yet complete (but very close). Orbcomm was scheduled for June-July, but I think they've been having payload-side delays there. SES-9 was slated to be the first flight with uprated Merlins. I wonder what's up with that. EDIT: with the apparent payload gap, I wonder if Pad Abort might slide past CRS-6. There's plenty of time afterwards, why rush the pad to squeeze Pad Abort between Turkmenistan and CRS-6? And Gwynne didn't say *when* in April the Pad Abort would be. Plus there is a financial incentive for them to launch before July. So it seems significant that Gwynne didn't mention them. Maybe the payload won't be ready in time. Falcon 9 has only flown 16 times. 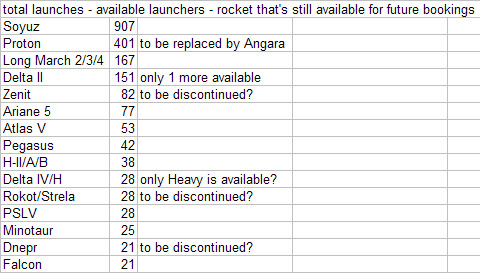 The no longer available Falcon 1 flew the other 5 times. The Falcon 1 shares flight heritage with the Falcon 9. Other launcher families are treated similarly, for example the 1965 Proton and 1966 Soyuz are undoubtedly very different from their modern incarnations. SpaceX's Gwynne Shotwell confirms that SpaceX will attempt landing first stage on drone ship on next two NASA CRS launches. hmmm tentacles have suckers so perhaps it could stick the landing better. [...] expects to meet its target of 13 launches and two test flights this year, President Gwynne Shotwell told Reuters. They will probably have to go through the same sequence (successful barge landings first, then RTLS attempts) on the West Coast as they are doing at the Cape, so I wouldn't expect to see an RTLS at VAFB this year. Why would you think this? Precision landing is precision landing. No matter where demonstrated. Surely you have heard of NIH (Not Invented Here). There is a corollary principle, "Not Demonstrated Here." It will be a different Range organization (30th Space Wing at VAFB vs. 45th Space Wing at the Cape) on a different Air Force base run by a different base commander whose main concern will be that a rocket not crash land on his assets, and while some successful landings at the Cape will go a long way towards assuaging their concerns, I'd be very surprised if VAFB allowed an RTLS attempt without having any barge landings done offshore on THEIR range first. Ranges are very conservative and have nothing to lose by demanding that the same protocols done elsewhere (eg multiple barge landings before RTLS) be demonstrated on their property before they allow something so new and potentially hazardous as incoming rocket stages. You also have to remember that the 30th Space Wing people will need to get familiar with new range safety regs and procedures for incoming stages, and they are going to have to get trained and up to speed before RTLS, and having SpaceX doing some barge landings first will let them get up to speed before a live RTLS scenario. I could be wrong, of course. But I'd be willing to bet a case of beer that VAFB will not allow an RTLS attempt until SpaceX does at least one successful barge landing on a launch out of VAFB first. I think you're wrong. Requiring a demonstration on the West Coast after it ha been demonstrated off the East Coast is just far beyond the limits of how irrational the base commander could be. Ask to have a separate review of the data -- maybe. But not another demonstration landing. Anyway, this would be such a high-visibility decision the base commander would have to worry about his career if he made such a stupid decision just for his own ego. Also, you have to consider that VAFB does more in the way of experimental launches compared to operational launches compared to CCAFB. Vandenberg is where ICBMs are tested. Just a question, would any Vandenberg landing have to dogleg around the oil platforms? I think you're wrong. Requiring a demonstration on the West Coast after it ha been demonstrated off the East Coast is just far beyond the limits of how irrational the base commander could be... Anyway, this would be such a high-visibility decision the base commander would have to worry about his career if he made such a stupid decision just for his own ego. Also, you have to consider that VAFB does more in the way of experimental launches compared to operational launches compared to CCAFB. Vandenberg is where ICBMs are tested. I respectfully disagree. The base commander would have to worry about his career for putting base safety first? No way. That's his number one job. Where he *would* have to worry about his career is when an incoming stage crashed on a building and he was judged not to have been sufficiently rigorous in safety procedures. Base commanders have been fired for not securing aircraft adequately in advance of storms. I'm not aware of any being fired because he was too careful in securing his base. And where is it written that just because a landing demo is done at the Cape, he cannot require a similar demo on his base first? The Air Force makes the rules on both ranges, and if the Air Force says demo barge landings have to be done at both ranges, that's the way it will be. If you have knowledge that the Air Force has agreed to allow SpaceX to attempt RTLS at VAFB solely on the basis of barge landings at the Cape, then I'm wrong, obviously, but I haven't heard of any such explicit agreement. All I know is that they're requiring barge landings at the Cape before allowing Cape RTLS. I haven't heard anything about VAFB range requirements. And as for VAFB having experience testing ICBM's, to my knowledge they have all been outgoing, not incoming, which is a different kettle of fish. OK, we disagree, let's move on. Time will tell what actually happens at VAFB. I will note that both launch from SLC-4E and flyback to SLC-4W will overfly SLC-6, assuming launch is to the south, so some caution is certainly warranted. I take no position as to whether that caution justifies a separate demonstration flight. But the nation’s No 2 telco has plans to launch another satellite in 2018 and will need a launch a partner to provide the rockets that would send its precious payload into space. My take is that these guys are at least shaking down Arianespace, but most likely will end up contracting with SpaceX. I also think that expansion in Australia/NZ/Philippines telecom and earth monitoring satellites will be good business over the next 10 years. Incoming ICBM's at an Air Force base... I'm getting flashbacks of Wargames & Defcon 1. Anyone know which future spacex mission will do TLI, I just found this and am wondering what the primary payload is. I was wondering if they would be a secondary on Astrobotics' proposed launch? I still don't see them in spacex launch manifest so I guess Astrobotic doesn't have a real contract yet. Anyone taking a step back? We have a potential for the 4th 5th SpaceX launch this year and it is still April! We were waiting for the 4th launch last year in August. Psst, I think you mean "5th".